It is, of course, possible to simply sharpen a pencil with a knife. One of these is invariably carried in the pack whilst on the trail. However a dedicated sharpener not only produces a good consistent point for drawing but there is less waste too. Important when limited supplies are being carried on a trip that may last multiple days, or even weeks. There are any number of pencil sharpeners available. Just a quick trawl though a couple of drawers need my desk turned up those shown here. A couple of these are pretty good options, more on these below. What is required is a quality product that is also lightweight. 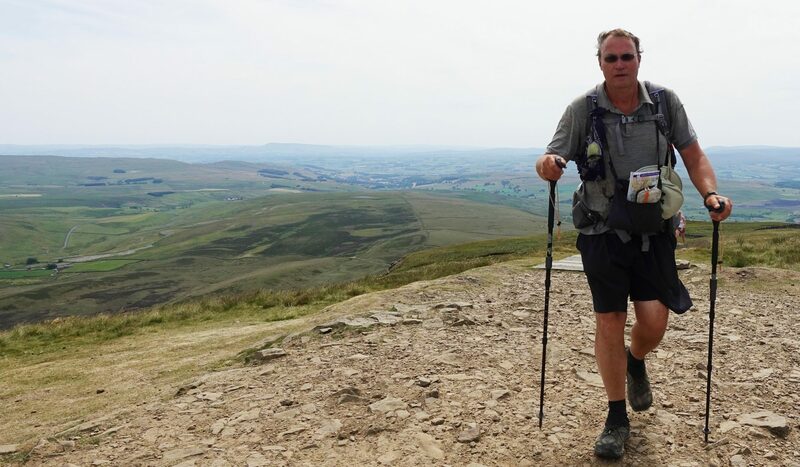 Weight is not normally a factor for anyone considering which sharpener to purchase, however it is very obviously a matter of concern for the lightweight hiker. This does not necessarily mean expensive; there are some excellent cheap sharpeners available. However it is just as easy to find a good sharpener as it is bad ‘un. The blades should hold an edge for longer, it should be easy to hold and not of too fragile construction. I have a penchant for those sharpeners made by KUM. I have noticed that most of my sharpeners from this German manufacturer company were actually made in Ireland. Different sharpeners will produce different types of point. You can obtain an obtuse, medium or long point, depending on your preference. While I use the excellent Möbius+Ruppert Brass Grenade at my desk at work and home, that is a heavy piece of kit unsuited for the trail. For a truly lightweight art kit, there are a couple of really lightweight plastic and wooden body sharpeners for use with traditional wood case pencils. The KUM Woodcutter wooden block single hole sharpener (3.5g) is another lightweight option, again, with a high quality blade that will not dull for some time. Either are good choices for a one day to week long hike. But I believe neither of these little sharpeners are robust enough for extended use on a longer hike. Neither of the two sharpeners will produce a long point on my pencil, which is more suited for shading work and is my preference. 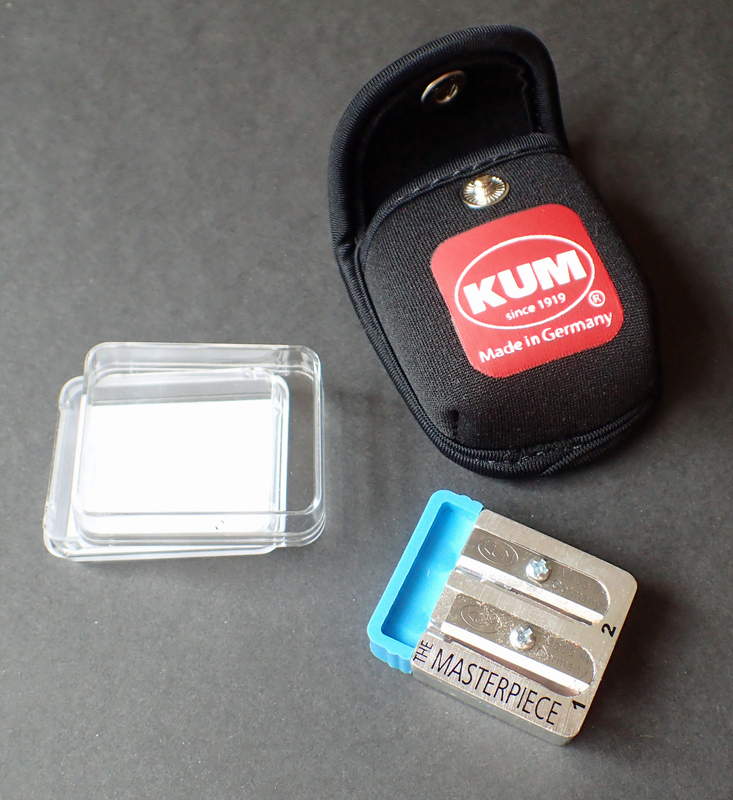 The KUM two-hole Long Point sharpener (16.6g) is made of Magnesium with high carbon steel blades. This is not a cheap sharpener but is the finest and most effective I have come across. When purchased it is in overkill packaging, coming in not only a two part, clear, hard plastic case (5.3g), but also a neoprene poppered pouch (7.8g). There is no need to cart this along with me. Pencil sharpening with this tool is an easy process but a routine must be followed. First sharpening in the hole marked ‘1’, (really idiot proof! ), which shaves away the wood but leaves the graphite untouched. Sharpen until it touches the blue plastic stop. Then transfer to the ‘2’ hole and sharpen again until the wood taper will go no further. When withdrawn, there is a fantastically long sharp point on the pencil. 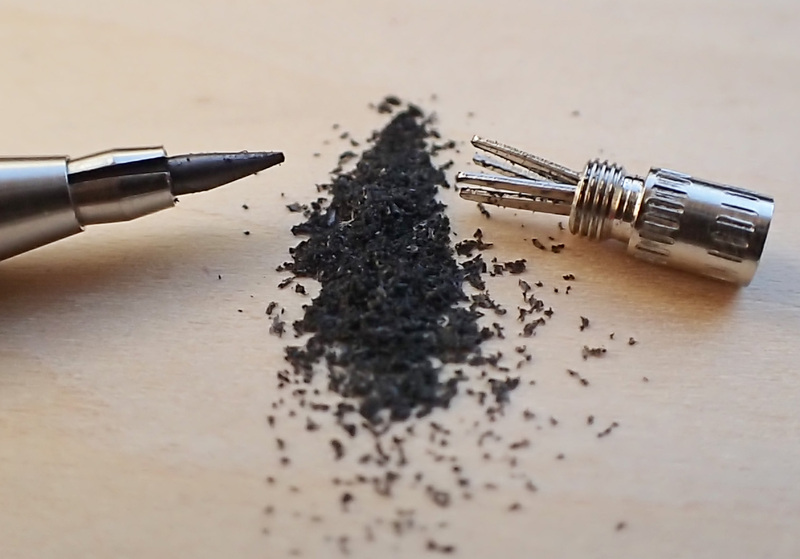 If taken along on a hike, you can use the graphite shavings for wiping over the hinge or pivot points of a knife to keep lubricated. The blue plastic stop block can be slid off the magnesium block if wished and a much longer exposed graphite can be produced, not that I need to. The plastic block also holds two replacement blades. The plastic stop block (3g) of The Masterpiece is not strictly required as with just a little practice, the first stage sharpening can be halted when required, by eye, and the part two sharpening can not be overdone. So just the main block (13.6g) of the sharper is required. However, if this sharpener accompanies me on trips, I still include both metal sharpening block and plastic stop as it then provides two spare blades. Additional spare blades can be purchased. 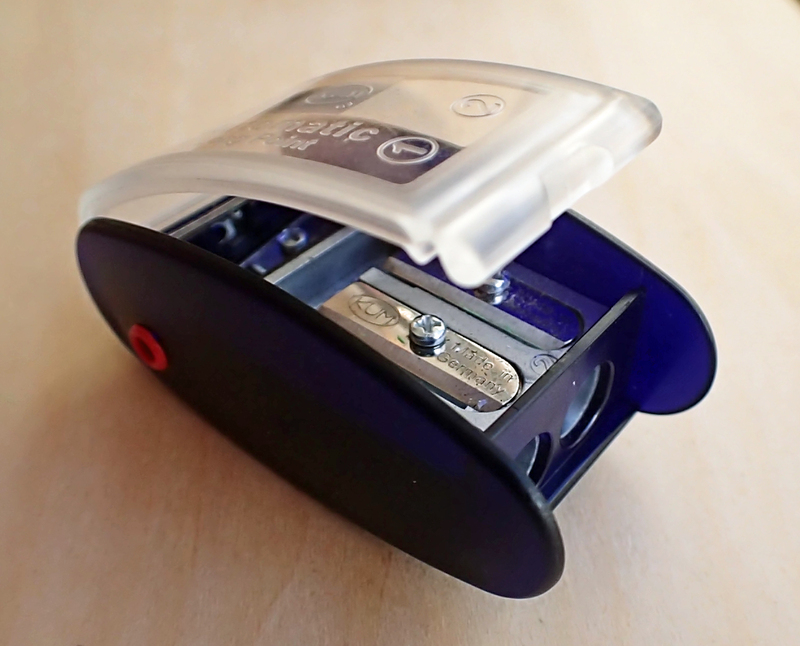 Total weight of sharpener, without case is 16.6g. While the KUM two-hole Masterpiece above is is an excellent choice for a lightweight art kit for holidays etc., offering great reliability and excellent, consistent results, this is not the sharpener that escorts me on day hikes. Also, much as I like The Masterpiece, it really is overkill for longer hike where grams matter. 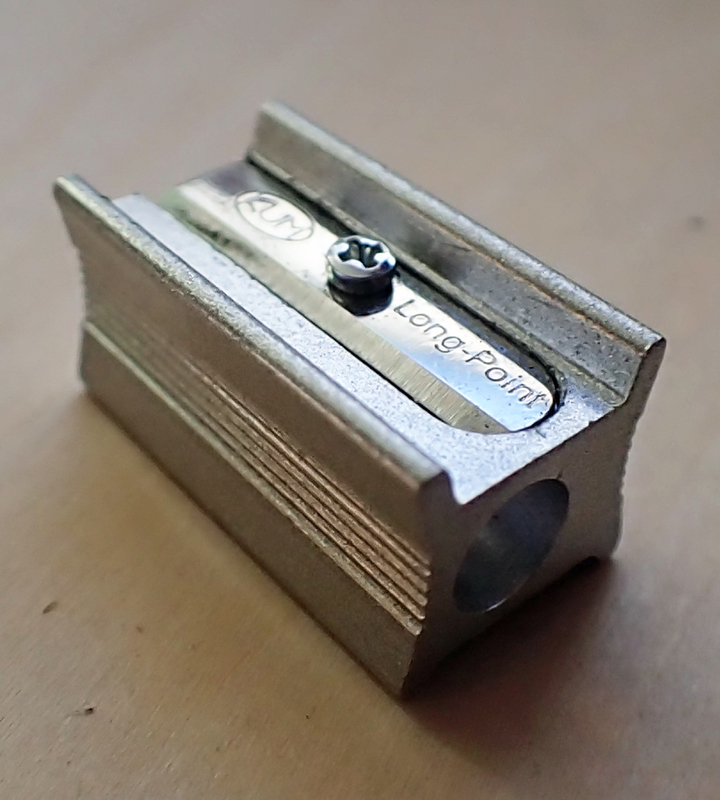 Instead, I might consider taking along its little brother- the KUM 1-hole Long Point magnesium block sharpener if I am also taking wood-cased graphite pencils. The stainless carbon steel blade produces my preferred long point but this sharpener also shaves off a handful of grams, weighing 9.3g against the 16.6g of The Masterpiece. One interesting potential bonus of carrying a pencil sharpener made of magnesium on a hike is its use as an aid to fire starting. Not only can fine shavings of wood, either from pencils or twigs, be made for use as tinder, but by scraping off shavings of magnesium from the sharpener block with a knife (or the blade from the sharpener itself), these can take a spark from a steel with ease. Another use for a pencil sharpener is as a tent peg maker! At a pinch, emergency pointed tent pegs can also be crafted from found wood, with points of green wood being hardened over a flame. While the Mikro shown earlier will capture a modicum of pencil shavings, the others shown above will not. So care has to be taken to avoid littering, especially if sitting in a cafe or similar. 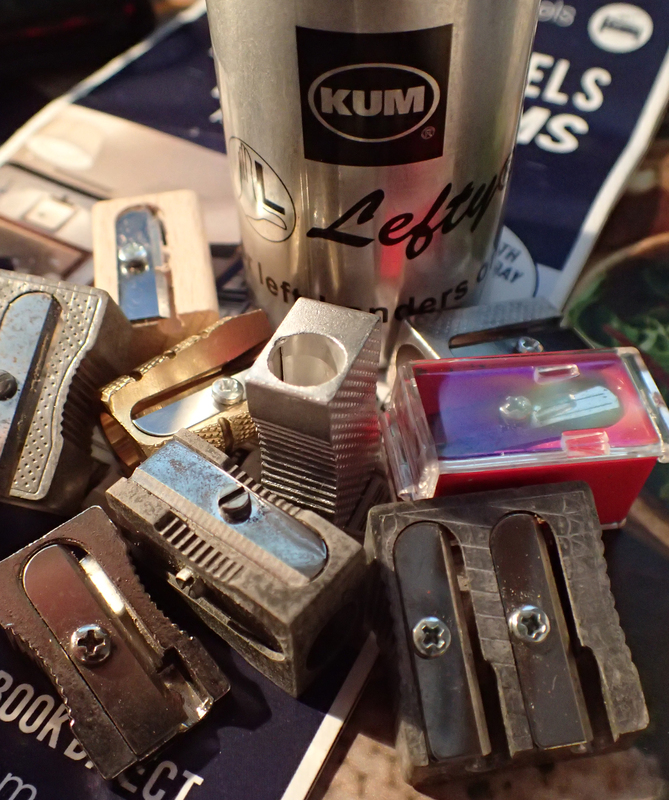 What is more useful in such urban settings is a sharpener such as the KUM Automatic Long Point (26g). There is nothing automatic about this sharpener, it is just as manual as the others, but what it is, is a similar 2-hole Long Point sharpener within a reservoir case with a folding lid that can be opened up to empty shavings. This sharpener also has two holes in its sides, one for 2mm, the other for 3.5mm leads, really handy if carrying clutch pencils too. Again, there two spare carbon steel blades stored in the body of the sharpener. 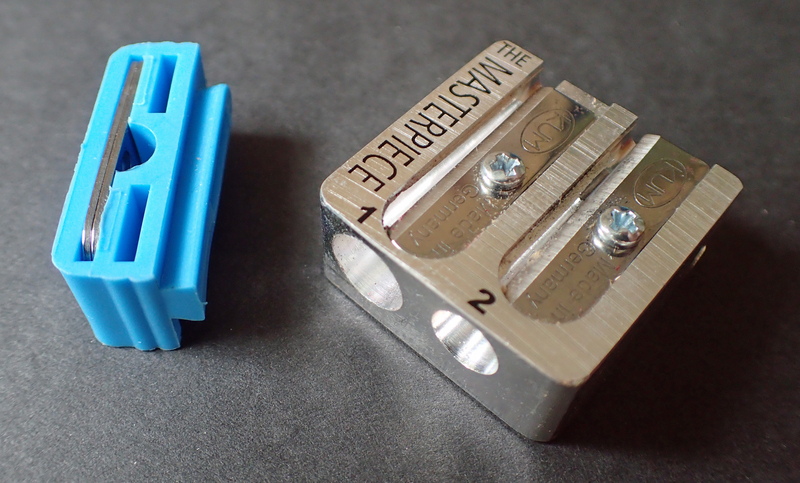 It is possible to find variants of this sharpener that only have the 2-hole Long Point sharpeners. As noted above, the KUM Automatic can also be used for sharpening the standard sizes of leads in clutch pencils. If only clutch pencils are included in an art kit, then only a sharpener, or pointer, for those leads needs to be included. There are some excellent choices. The 2mm sharpener from Kita Boshi (7.9g) is a simple affair with four metal sharpening blades mounted in the end of a clear plastic case. The black cap is a snug fit so there is little chance of the graphite shavings coming out until you purposely empty it. The biggest drawback to this pointer is that I cannot actually get a sharp point with it. However the point I do get is mostly adequate for sketching. 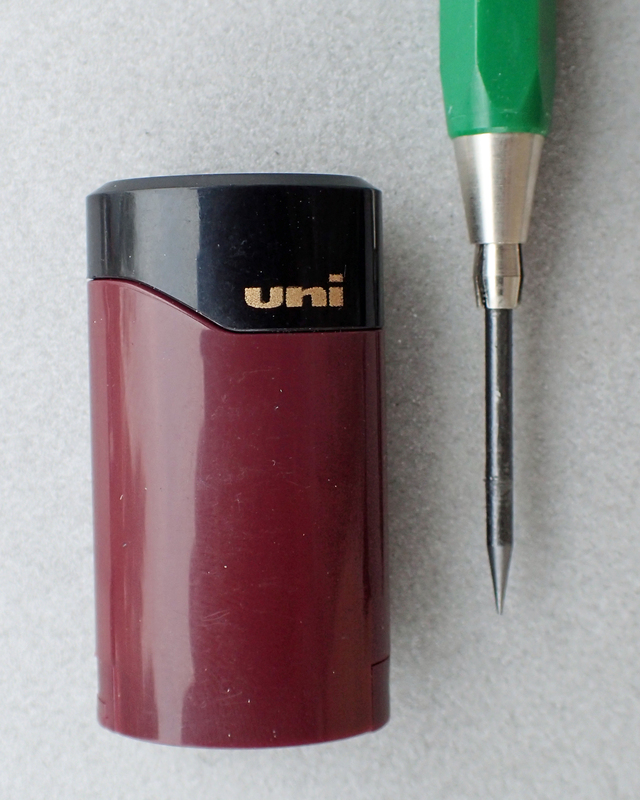 The lovely little encased Mitsubishi Uni sharpener (5.2g) is very small, lightweight and effective. This is capable of handling quite soft leads and stores the shavings inside its body until the small sliding cover in the bottom is opened to dispose of the contents. This is the best 2mm sharpener that I have come across that combines small size and functionality with a reservoir for shavings. 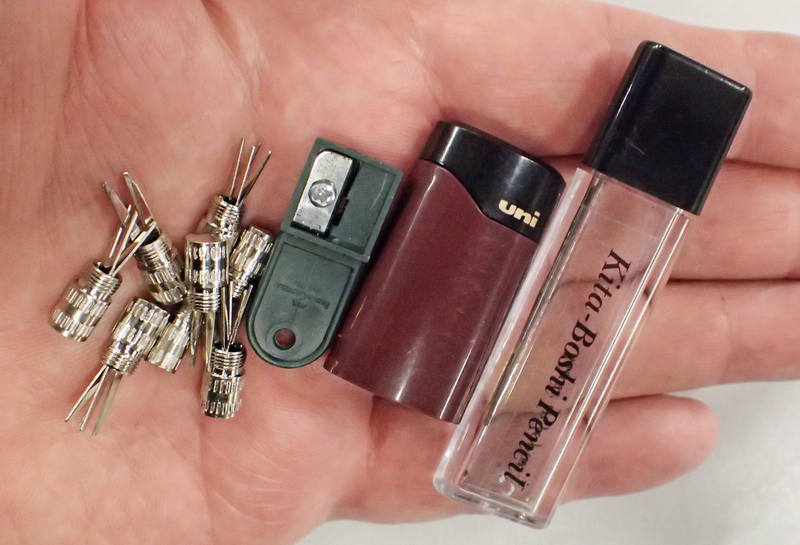 Things get very small with these little sharpeners. If even the excellent Mitsubishi Uni shown above is overkill for the minimalist hiker, then surely one of these little sharpeners will be suitable. The four pronged sharpener in the Koh-I-Noor clutch pencils comes combined within the push button cap, but one of these could simply be carried loose if desired. Because they are so small, taking a spare might be considered wise. Two sizes are available, one for 2mm leads (1g) and a larger one for leads up to 3.5mm (1.4g), including 2mm. The little lead pointer from Faber Castell (1.3g) is traditional in design, incorporating a single 12mm long blade for use with 2mm leads. Very, very small, it is intended to go on a key ring or similar, so could be attached to a pouch zip or whatever you keep your art materials in. Don’t drop it, the muted green colour blends in well with undergrowth. 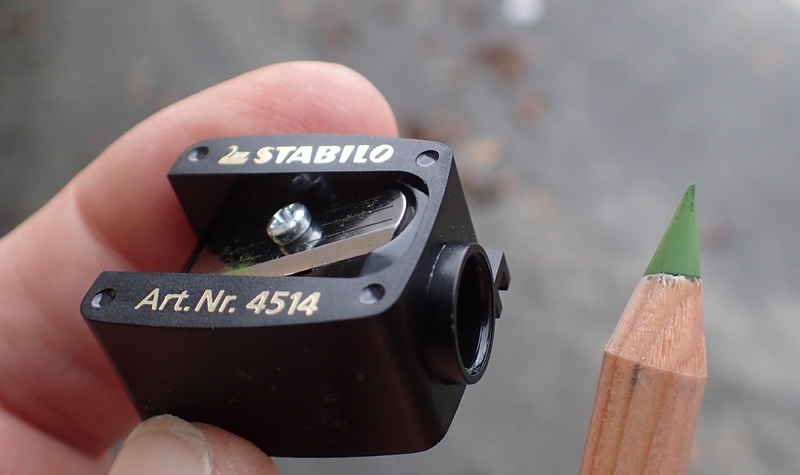 If you want something brighter, KUM make their own version of this little sharpener, the KUM 233, or a similar product, the KUM 250, for 2mm and 3.15mm leads with a small reservoir for shavings. 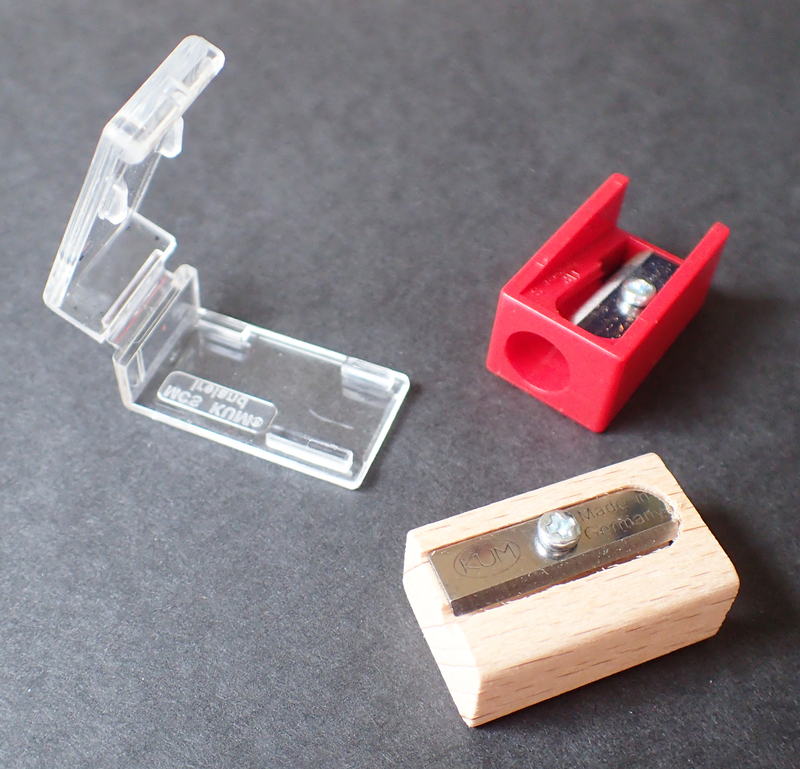 These little sharpeners can be little fiddly to use, but that is hardly surprising given their minute size. With practice and care though, a good point can be obtained. If carrying one of the flat, carpenters style, pencils, then either sandpaper or one of the dedicated sharpeners such as the Hanson VersaSharp may be useful, however I tend to rely on a pocket knife for these pencils. For most longer hikes, a sharpener may be superfluous as a small knife, such as this lovely Victorinox Evowood 81, is invariably carried. A small blade such as this is more than up to the job of keeping a point on a wood-cased pencil but a good edge needs to be retained on the knife itself. However note that if flying with a travel art kit, a knife will need to be stowed. While I seldom take pastel pencils with me on a hike, it is worth noting that few of the sharpeners mentioned above are suitable for use with the softer leads found in pastels. Instead, sandpaper or a dedicated sharpener are more suited. Something like the Stabilo Carothello (4.1g) or single blade sharpener that Koh-I-Noor produce for 7mm leads are fairly good. These sharpen to a medium point with a fairly wide angle (short cone) and, with care, this lightweight sharpener will handle soft ‘leads’ with relative ease. Note that this sharpener will not accept all pastel pencils, for example the barrel of the Derwent Pastels is slightly too wide and another option is required such as Derwent’s own pastel sharpener. As can be seen, there are many lightweight options available. Far more than the small selection I have shown above picked from my own supplies. I tend to pick the sharpener for my lightweight art kit depending on what type of trip I am embarking on. What sort of pencils am I taking- standard graphite pencils, or clutch pencils, am I taking odd shaped or thick barrel pencils. Is it mostly indoor sketching, where I want to catch shavings, is it a short day hike where weight and bulk might be less important, or is is a long, multi day hike where weight, bulk and, primarily, when reliability is most important? Sharpeners are not expensive, try a few and see what works.